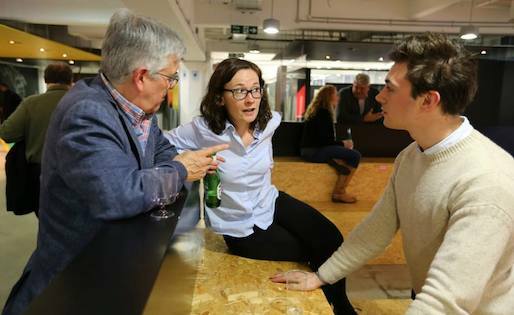 Attendees discuss ideas at the Opening Night Reception at Wayra, the night before the Journalism Innovation Summit. Photo by Basile Simon. MediaShift produced its first-ever Journalism Innovation Summit, a one-day conference to tackle some of the trickiest topics posing the media industry, on May 15, 2015, at the City University London. The Summit took on various hot-button topics — where to distribute innovative content, how to increase audience engagement, and what are the most promising business models. The day was split into a morning keynote, panel and breakout sessions devoted to content, and an afternoon keynote, panel, and breakout sessions devoted to business models. There was an opening reception at Wayra co-hosted by BBC News Labs, and a closing night reception hosted at Bloomberg. If you’re reading this, chances are you’ve probably mulled over these topics as well. The Summit was a chance to hear from panelists representing both legacy and new media, and to participate in group activities to network and collaborate. We’ve rounded up photos, coverage, feedback, and a Storify to highlight some of the ideas that emerged from the Summit. Did we miss anything? Let us know, and we’ll update the post. And if you missed this event but want to join us for our next one, register now for Collab/Space New York, hosted at the Ford Foundation on July 15!